Cut sugar cane into thirds. Cut lengthways into quarters for 12 skewers. Place onion in a food processor and process until finely chopped. Add prawns, garlic, cornflour, sugar and fish sauce and season with salt and ground white pepper. Process until a coarse paste forms. Line a tray with baking paper. Using wet hands, mould the prawn paste around the end of each skewer. Place on the tray. Cover with plastic wrap and place in the fridge for 30 minutes to rest. Heat a large non-stick frying pan on high. Add prawn skewers and cook, turning occasionally, for 5 minutes or until browned and just cooked through. 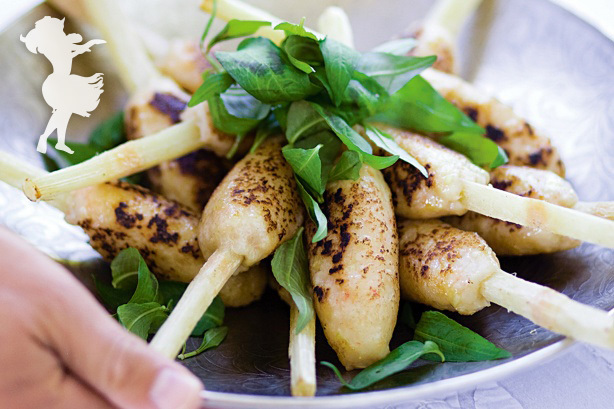 Place on a serving platter and scatter with Vietnamese mint. Serve immediately with nuoc cham and pickled vegetable salad. Thank you to our customers and Happy New Year. Look forward to new products in 2016!